Shoulder-scrunching, back-spasming, and muscles tied into quaintly-knit bundles are just a few of my not-so-favorite things, and if one’s thing for sure, it’s that I’m not alone. So for the sake of every person who sits at a desk all day with less-than-stellar posture, has some kind of workout routine, or is just prone to bumping into countertops en route to the refrigerator at (give or take) 12:30 a.m., this one is for you. It’s been about one month since I first tried out Lather Muscle Ease Gel ($18), and let me just say my first thoughts upon slathering it all over my aching shoulders and neck were 1) This feels amazing (there may have been one other adjective in there too, but I’ll spare you the French) and 2) I have to write about this. Well, here we are. Though it’s something I’m working on, if there were an Olympic medal honoring the ability to scrunch shoulders up to the earlobes for hours on end, I would make the podium. Combined with years of dance, a helter-skelter workout routine, and a touch of minor scoliosis, that habit has plagued me with annoying aches and pains over the years that ebb and flow in severity. Most of the time it’s manageable enough that I can get on with my everyday routine. However, every once in a while, I’ll wrong myself while driving, yoga-ing, or just plain old sleeping and wake up the next day almost unable to move my upper body. And truthfully, other than a couple of painkillers or an intense deep tissue massage (Ryan at Barlow Clinic is magic), I haven’t found any type of treatment—especially something topical—that’s been able to offer up any lasting relief. Until, that is, I was blessedly given a sample of the Lather gel to try. Or, as I like to call it, my massage in a tub. Typically, and because it does have a noticeable, tingling-warming-cooling sensation to it, I like to put it on right before bed. Not only does it relax and kind of numb my muscles into a blissful state of oblivion as I drift off, but I also wake up sprightly, pain-free, and bushy-tailed. In fact, it mimics the same—dare I say superior—feeling I get following a $100-plus massage, at a fraction of the price. 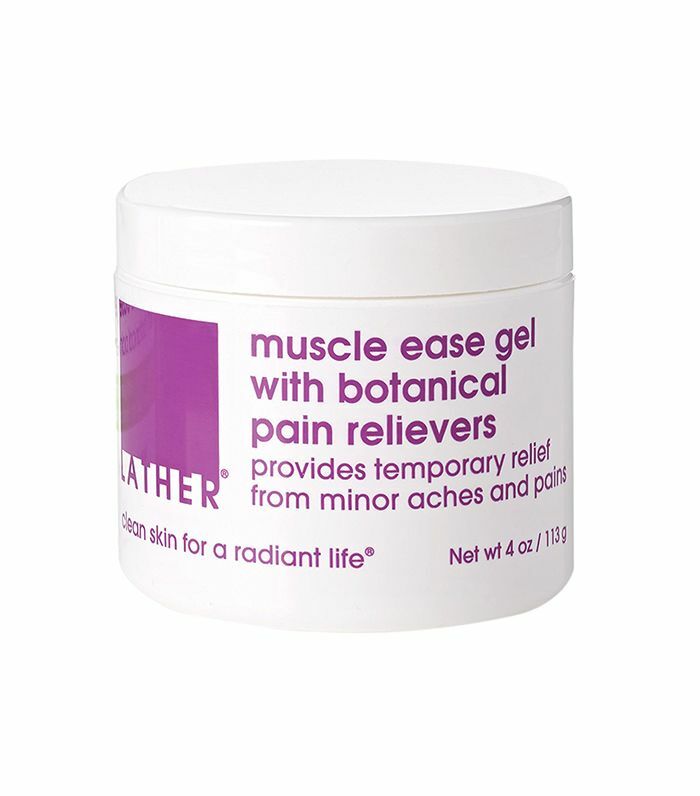 It’s also worth noting that since the gel is strictly intended for the minor aches and pains of muscles, joints, etc. and for the temporary treatment of things like back and neck aches, arthritis, strains, bruises, and the like, it doesn’t replace a visit to the doctor. So please, go get checked out and earn the green light from your doctor before trying a topical aid like this one. That being said, once you do, you’re going to love it. Next up: The one exfoliator that actually gives my sensitive skin an ethereal glow.